The Queen, accompanied by The Duke of Edinburgh, The Duke of Rothesay, and Peter and Autumn Phillips, attended the annual Braemar Gathering in Scotland. 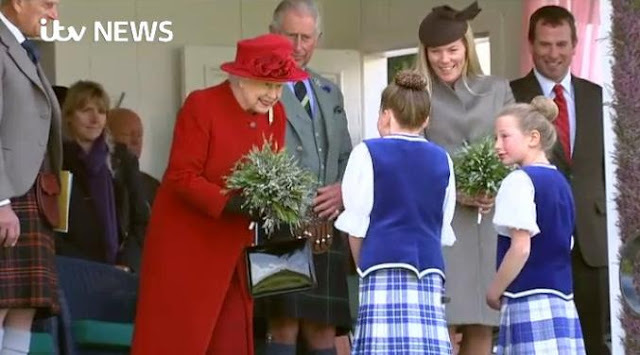 The Braemar Feather Brooch, which has been her choice for this annual event since receiving it as a Golden Jubilee gift from the Braemar Royal Highland Society, really pops on a rich solid color - as, coincidentally, does Her Maj. They're hard to spot, but The Queen also has on her more "casual" set of pearls, with simple stud earrings and a single strand necklace. Autumn Phillips looks pretty elegant, doesn't she? Nice to see some family gathering as The Queen's big day approaches (September 9th, when she will pass Queen Victoria as the longest reigning British monarch, if you've not been paying attention).